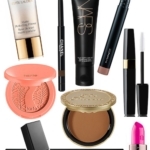 What’s the best (and one of the most affordable) ways to update your makeup look for Fall? With a new lipstick, of course! 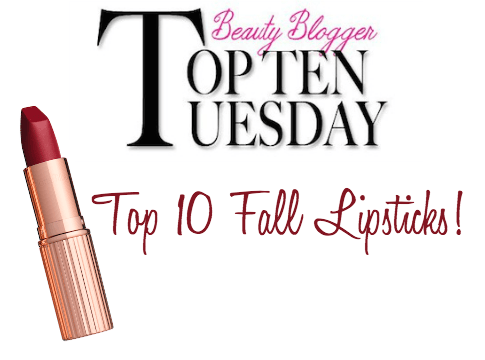 I’ve searched out the best of the Fall collections to come up with the Top 10 Best Fall Lipsticks; these are the must-haves! Last season’s Fall color palette was all about the Color of the Year, Marsala. This season, I feel the color direction is inspired by the different shades of wine. 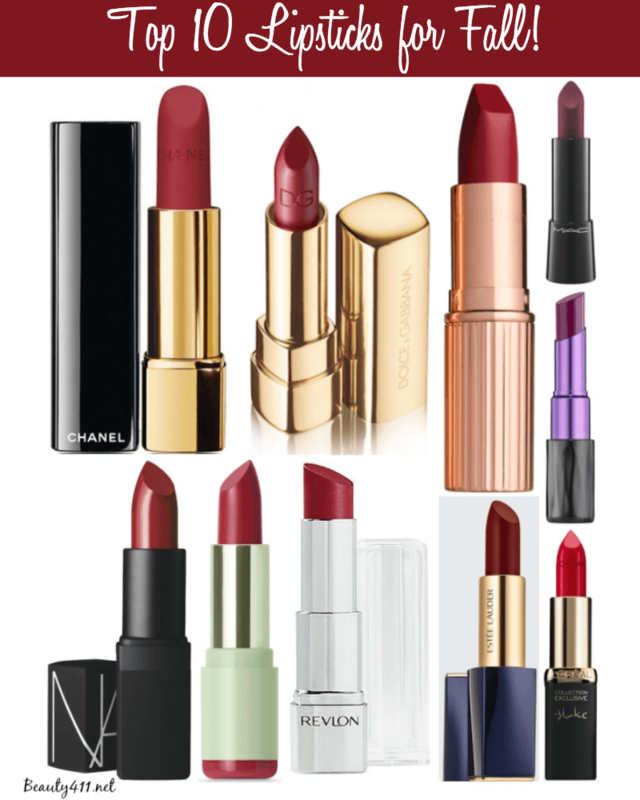 Rich reds, robust burgundy, deep plums….there is a hue for every shade and skin tone. 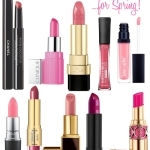 The must-wear texture for this season’s lipsticks is matte; thankfully the formulas are much improved, with excellent color payoff and non-drying, creamy, long-lasting color. 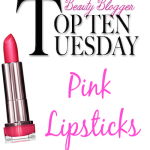 All of the lipsticks above have excellent pigmentation and wear. I tried to pick a variety of textures (cream and matte), recognizing everyone has different preferences. I feel like I need to speak to the matte formulas, as this is a texture I’ve personally stayed away from because of the dryness. Not so anymore! Because of the texture, I like to use a sugar scrub to prep lips (wait 5-10 minutes before applying lipstick) and for best results, apply with a lip brush. 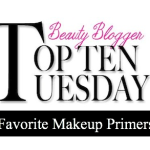 This was my first experience trying the Charlotte Tilbury line; the Matte Revolution Lipstick in Love Liberty applied like a dream, had huge color payoff and is long-wearing. I also loved the Estée Lauder Pure Color Envy Matte Lipstick; it feels good on, is long-wearing and the range has beautiful colors. I’ve been a big fan of Urban Decay’s Revolution Lipsticks and the new collection of Matte Lipsticks is intensely pigmented (as you’d expect) and has oils in the formula, so as not to dry out lips. Love! 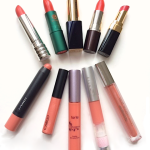 I also wanted to include some less expensive Fall Lipstick options. 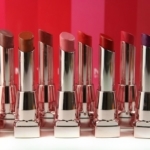 The L’Oreal Paris Colour Riche Collection Exclusives is a virtual steal at $8.99. The case is so chic, you’d never guess it was from the drug/discount beauty aisles. This was my first time trying the Pixi by Petra Mattlustre Lipstick and I can easily recommend it. The Plum Berry shade is so gorgeous. And while I love the color of Revlon Ultra HD Lipstick in Iris, the formula is so creamy that getting it in and out of the case without ruining it is the big challenge. It’s a wonderful color, though. 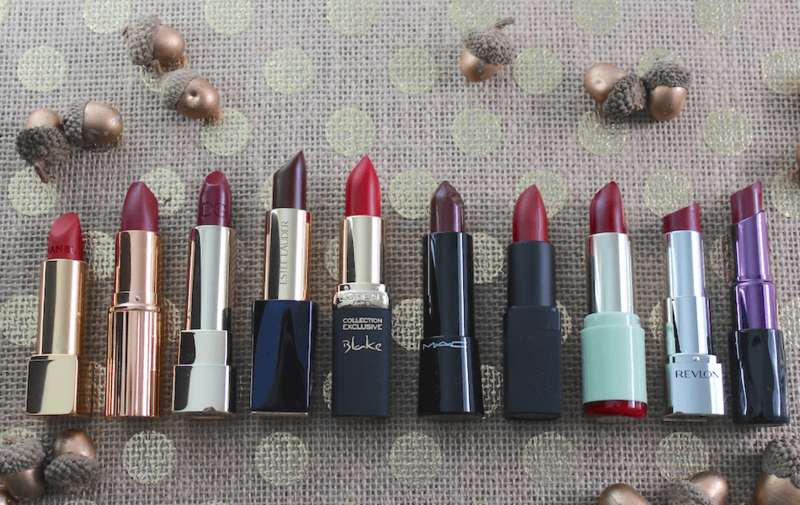 Have you found your perfect Fall lipstick shade yet? 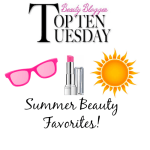 Make sure to check the picks from the other beauty bloggers participating in today’s roundup! Disclosure: Some of the above products are press samples provided by the brand/PR for editorial consideration, product testing and review. Others I purchased on my own. Affiliate links have been used in the post, which means a small commission is earned. Beautiful choices and much more fall than my picks. I only have the Pixi Plum Berry and am enjoying that. I love the brands you have here. Thanks Marcia! As you can imagine, I agonized over the choices! This could have easily been a Top 20 for me, haha! I love Urban Decay After Dark! I’m totally not surprised that we have a few of the same picks! 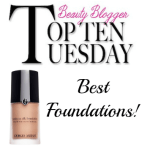 You gave me a few more that I need like the D&G and Charlotte Tilbury. 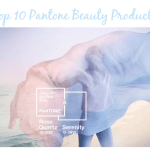 Such pretty rich, warm shades for fall! They are just so beautiful, love all of them!